Lumbar spinal stenosis is a medical condition where the nerves within the spinal canal experience compression. The spinal canal is the tube between the bones of your spinal column. When this tube is constricted or compressed, the internal nerves can be pinched or squeezed. With age, the tissues that are the closest to the spinal canal can often impinge upon the health of the internal nerves. 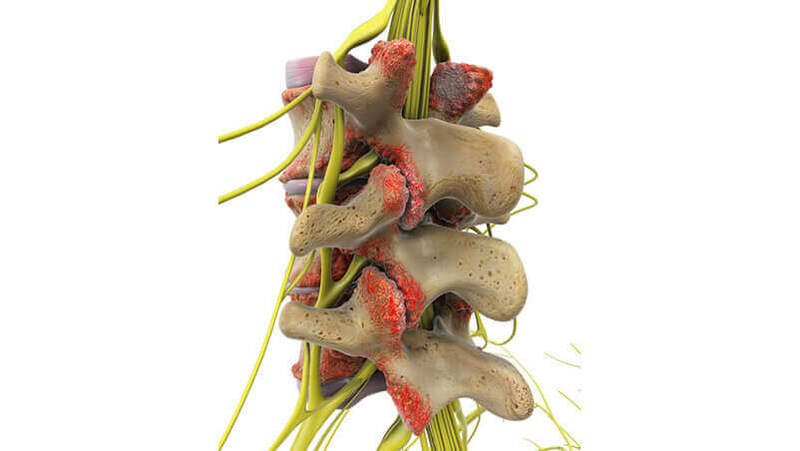 When these nerves are compressed, they can cause discomfort and pain in the back. While spinal stenosis can occur at any point in the spinal column, lumbar spinal stenosis refers to spinal stenosis of the lower back. What part of the spine is affected by lumbar spinal stenosis? The parts of the back affected by lumbar spinal stenosis include the spinal canal, spinal cord, vertebrae, spinal column, and discs. The spine is comprised of 24 bones that are called vertebrae, which are stacked on one another to create the spinal column. The spinal column helps the body stay upright and provides the shape of the torso. The back of the spine forms a bony ring, which creates a hollow tube that is known as the spinal canal. The spinal canal encases and protects the spinal cord throughout the spine. The spinal cord runs to the second lumbar (lower back). The spinal canal then closes to create a bundle of nerves. These nerves extend to the legs and pelvic area. The intervertebral discs of the spine lie between each vertebra and create a small space between the spinal bones. Intervertebral discs can act as a cushion and help absorb shock. When running, jumping, or performing other activities that rely heavily on the spine, these spinal discs can help reduce the strain placed on the spinal column. Each intervertebral disc is comprised of 2 parts, which include the nucleus and the annulus. The nucleus is the center of the disc, which is soft and spongy to help absorb shock. The annulus, made up of several resilient ligament rings, holds the nucleus in place. A healthy spinal canal is approximately 18 millimeters in diameter. Spinal stenosis begins when the spinal canal is 12 millimeters or smaller. If the spinal canal is 10 millimeters or smaller, severe spinal stenosis symptoms may become apparent. Some common causes for lumbar spinal stenosis include herniated discs, spinal instability, congenital stenosis, and spinal degeneration. A herniated disc occurs when a spinal disc becomes damaged and ruptures. In a healthy spine, spinal discs can withstand the shock of falling, jumping, or running, but if the pressure applied to a spinal disc is too strong, it may rupture. When ruptured, the nucleus of the spinal disc can break through the annulus and discharge from the spinal disc. When spinal discs herniate and the nucleus is forced backward, it can compress the nerves in the spinal canal and cause symptoms of spinal stenosis. Spinal instability is a condition that develops when the spinal bones move more than they would in a healthy spine. If you have experienced a traumatic accident or back injury, the spinal ligaments in your lower back may have stretched and become loose. When these ligaments stretch, the bones of your spine can shift or move more than they should. If spinal bones can shift or move too much, lumbar spinal stenosis can occur. Depending on genetics, some patients may be born with a spinal canal that is narrower than that of a normal spine. While spinal stenosis symptoms may not become apparent until later in life, a patient can be born with congenital spinal stenosis and not become aware of it until they are older. A narrow spinal canal can also increase the risk of spinal stenosis, which can even occur after a minor injury to the back. Patients with a narrow spinal canal often experience symptoms of spinal stenosis over time, as the spinal canal begins to narrow even more with age. One of the most common causes of spinal stenosis, spinal degeneration occurs with age. After years of wear on the spinal bones, the lumbar spine may be more at risk of spinal stenosis. Spinal discs may begin to collapse, which causes the space between each vertebra to become smaller. The formation of bone spurs may also occur and can protrude into the spinal canal, further reducing the space between bones and spinal nerves. Additionally, the ligaments which hold the vertebrae together may begin to grow thicker, which can apply pressure to the spinal canal. All of these age-related symptoms can cause lumbar spinal stenosis. Because most cases of spinal stenosis stem from spinal degeneration, spinal stenosis symptoms gradually worsen and become apparent. If you have suffered a traumatic injury or event that causes lumbar spinal stenosis, symptoms may develop quickly. While back pain may be a symptom of spinal stenosis, leg pain and leg weakness are also common symptoms of lumbar spinal stenosis. Some patients also report a feeling of pins and needles along the skin of the lower limbs. Additionally, some patients may feel a sensation of water down their leg or muscle cramping. Spinal stenosis symptoms may differ depending on the position of the lower back. If you are bending forward, your spinal canal widens, and spinal stenosis symptoms may subside or be less intense. Activities where you bend backwards or even slightly extend your back may cause the spinal canal to become smaller, which worsens symptoms. How does Dr. Rozbruch diagnose spinal stenosis? Dr. Rozbruch will begin with a complete review of your current and previous medical history. Dr. Rozbruch may ask you a variety of questions regarding your symptoms. Dr. Rozbruch will ask you to explain any symptoms or sensations that you experience frequently. In order to further assess your symptoms, Dr. Rozbruch may ask if any activities or positions help alleviate any symptoms. A physical exam can help Dr. Rozbruch determine what movements cause discomfort or pain. He can also examine your reflexes and strength during a physical exam. A spinal X-ray can help show if there are any changes in the spinal bones. Spinal X-ray scans help to determine if spinal degeneration has caused your spinal stenosis symptoms. Dr. Rozbruch will also be able to diagnose bone spurs that protrude into the spinal canal on a spine X-ray. Dr. Rozbruch may order a spinal MRI scan if he requires a more detailed look into your spinal health. A spinal MRI (magnetic resonance imaging) uses magnetic waves to depict the internal tissues of your body. A spine MRI can help determine if your spinal nerves are being compressed or squeezed. A CT scan of the spine allows Dr. Rozbruch to view sections of the bones. These spinal images can help in diagnosing bone spurs that are growing into the spinal column or that are reducing the space around the spinal nerves. If a diagnosis is still not achieved, Dr. Rozbruch may order an electromyogram, which is an electrical test that monitors the nerve pathways and assesses if they are working properly. SSEP, known as a somatosensory evoked potential test, can more accurately locate where the spinal nerves are being compressed within the spinal canal. An SSEP test can be used to measure the sensations of the spinal nerves. Sensory impulses travel up through the spinal nerves, which helps the body determine the sensations of pain, touch, or heat. An electrode is placed over the skin above which the nerve travels to record the functions of the nerve. If your symptoms do not stem from spinal degeneration, a blood test may be needed to determine if the symptoms you feel may be caused by another medical condition. What spinal stenosis treatments are available? In most cases, Dr. Rozbruch will initially suggest a nonsurgical spinal stenosis treatment. If you display severe symptoms, do not respond to nonsurgical spinal stenosis treatments, or have symptoms that are progressing rapidly, Dr. Rozbruch may suggest a more invasive treatment initially. For most patients, Dr. Rozbruch might suggest a period of bed rest or sleeping in a curled position to help open your spinal canal. These spinal stenosis treatments are typically used first or for patients with mild spinal stenosis symptoms. If your symptoms worsen or do not improve, Dr. Rozbruch may prescribe spinal stenosis medications to help relieve pain. Oral medications such as anti-inflammatories are often prescribed to help reduce the pressure placed on your spinal nerves within your spinal canal. In elderly patients taking oral medications for spinal stenosis, Dr. Rozbruch may closely monitor your health to ensure the medications do not pose additional complications. In some cases, a muscle relaxer may be prescribed if a patient suffers from uncomfortable muscle spasms. Epidural steroid injections, commonly referred to as spinal stenosis injections, can help reduce the severity of spinal stenosis symptoms. Injecting medicinal steroids into the epidural space within the spine can help reduce inflammation in the discs, joints, and nerves, providing the spinal nerves with additional room to move within the spinal canal. Physical therapy is also a viable spinal stenosis treatment. Physical therapy can help you focus on specialized positions and exercises to ease the discomfort of spinal stenosis. Lower back stretches can help relieve the compression placed on the spinal nerves. Aerobic or strength exercises can also help combat the symptoms of spinal stenosis. By increasing the strength and endurance of the spinal muscles, some patients experience a regression of spinal stenosis symptoms. What spinal stenosis surgeries are available? In some cases of spinal stenosis, nonsurgical treatments may not adequately relieve symptoms. If you still experience moderate-to-severe spinal stenosis symptoms, Dr. Rozbruch may suggest spinal stenosis surgery. Spinal stenosis surgery is often recommended if the pressure on your spinal nerves appears to be increasing. If you experience weakness in the legs, continuing pain, or bowel and bladder complications, spinal stenosis surgery may be needed. Excess pressure on the spinal nerves can cause a patient to lose control of their bladder or bowels. This is a symptom of severe spinal stenosis that must be fixed immediately. If spinal pressure to this extent is left untreated, it may cause permanent damage. The main spinal stenosis surgery is a lumbar laminectomy, but some patients may also need to undergo a spinal fusion surgery to correct spinal instability following a lumbar laminectomy. A lumbar laminectomy is a spinal stenosis surgery that removes the lamina bones from the spinal column to alleviate the built-up pressure on the spinal nerves. This is the most common type of spinal stenosis surgery. In some cases, lumbar fusion surgery may be required following lumbar laminectomy surgery to correct spinal instability. Spinal fusion surgery is where 2 or more spinal bones are fused together, reducing excessive bone and joint movement. What should I expect after a lumbar spinal stenosis treatment? Dr. Rozbruch may suggest working with a physical therapist after a spinal stenosis treatment, even if you did not undergo spinal stenosis surgery. During physical therapy, patients are often seen multiple times a week for 1-2 months. Your physical therapist can help educate you on how to move and perform activities properly so that you can avoid hurting your back in the future. Some spinal exercises can also be prescribed to help widen the spinal canal to relieve spinal stenosis symptoms. Improving the strength, endurance, and coordination of your spinal and abdominal muscles can improve your symptoms. What should I expect after spinal stenosis surgery? Following spinal stenosis surgery, physical therapy is often suggested for patients. If a patient has also undergone spinal fusion surgery in addition to a lumbar laminectomy, he or she must wait 2-3 months before beginning physical therapy for spinal stenosis. Full recovery after a spinal stenosis surgery may take up to 6 months depending on the severity of your condition, your medical health, and your body’s rate of healing. During physical therapy, heat, ice, or electrical therapy may be used to help ease muscle pain or discomfort. After treating the immediate pain following spinal stenosis surgery, physical therapy is designed to help reteach you healthy habits when performing various activities. By learning how to get dressed, lie down, or perform light activities while protecting your back, you can decrease pain and discomfort in your lower back. As physical therapy progresses, you will begin to practice more difficult tasks. At the end of physical therapy, you should be more comfortable with performing more involved tasks, such as lifting an object. When your physical therapy ends, your physical therapist will help you develop a long-term exercise plan to reduce painful symptoms and improve the health of your spinal muscles. How can I learn more about lumbar spinal stenosis? To learn more about about a spinal stenosis treatment, please request an appointment online or call Dr. Rozbruch’s orthopedic office in NYC at 212-744-9857. Prior to an office visit, please fill out Dr. Rozbruch’s patient forms to expedite your first visit.